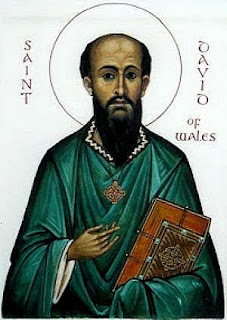 Dewi Sant – St. David was born towards the end of the fifth century. He was a scion of the royal house of Ceredigion, and founded a Celtic monastic community at Glyn Rhosin (The Vale of Roses) on the western headland of Sir Benfro, at the spot where St. David's Cathedral stands today. David's fame as a teacher and ascetic spread throughout the Celtic world. His foundation at Glyn Rhosin became an important Christian shrine, and the most important centre in Wales. The date of Dewi Sant's death is recorded as 1 March, but the year is uncertain – possibly 588. As his tearful monks prepared for his death St David uttered these words: "Brothers be ye constant. The yoke which with single mind ye have taken, bear ye to the end; and whatsoever ye have seen with me and heard, keep and fulfill."